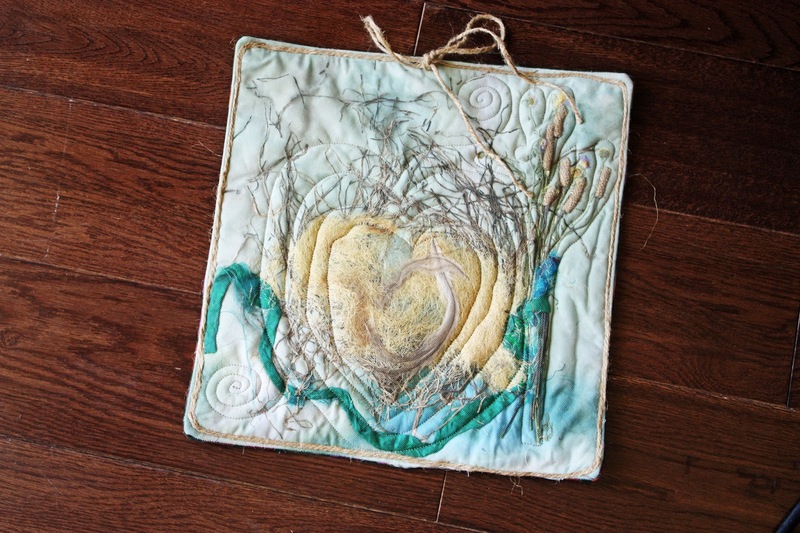 Quilting is Art. I have had a great week of cleaning my house, visiting friends, and helping family. It has been a really fun one. Also, I got the chance to dig out a Quilt-In-Progress! but before that... a thought. Quilting is Art. I love the fact that you can try a million different ways to express a love for color or a style. I got a chance to make an official ART Quilt, although I think of every quilt in that way actually. I participated in a class that our local guild offered. 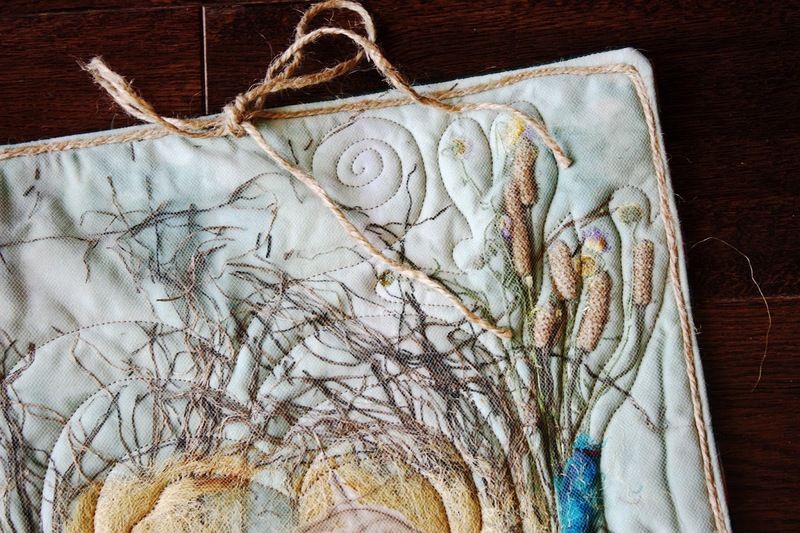 What makes this quilt a little more ARTY than others is that it includes some more unusual items... like weeds and feathers. Also, another thing that contributes to the ARTY quilt is the meaning that is thrown in there. It is funny how each quilt I make I get a tender feeling for and I know I have mentioned this before. Lately, I try to tie some significance to each quilt. That meaning for me is usually something that I feel inside or things that remind me of people or experiences. It is kinda cheesy and no one would really know but me, but I wonder if it shines through a little bit to others?? Anyway, with this quilt especially I did just that and I am pretty sure that was really the assignment I think? from our quilter's guild. The teacher did the same thing in her Art Quilts she showed. I won't bore you with the meaning but here are some close up pics. 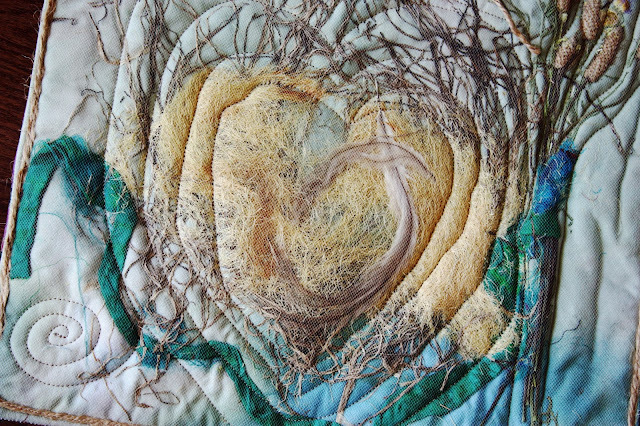 I quilted it on my Long-Arm and it went pretty good but the weeds were a little thick so it was a bit shaky at first (but I guess that it works well with my meaning even if it was unintended). PLUS - there are clovers in there! So that is my ART Quilt. Back to the Quilt-In-Progress... I believe is a true work of art because of the time and patience and skill that has already gone into this quilt and it isn't even finished. It is getting CLOSE though!! ;)! I got my double trouble quilt out and it is almost all sewn up!!! I didn't realize how close I was when I packed it away a couple months ago because just the last few days I haven't put tons of time into it and look where I am at! I am so excited to get it finished! I am going to get the top sewn up today and then I will save the Long-Arming for a little bit later. I want to make sure I know what design I will do and I just let it float around in my brain for awhile, because I am an ARTIST...., LOL. In conclusion - I love quilting and the definition of art is displayed below and actually all of my quilts are truly ART QUILTS when taking the true definition into consideration, but I do think that some are just a little more amazing than others and I am glad to have tried a different kind of Art Quilt with the unusual contents and I am even more glad I am almost done with my most difficult quilt yet ;). I love your art quilt. It looks like Rush Valley ha ha.